Storage that is modern, spacious and lockable is all yours when you opt for our 1020mm double door cupboards. The grey metal finish is very stylish looking and great for offices, education institutions and all other places, where you’d like smart storage. The first cupboards looked very different to what most people associate with these very common items today. It makes perfect sense that products that have been around for hundreds and hundreds of years evolved over time to match the needs of our homes and offices. Back in the 1300s, there weren’t as many techniques and innovative devices that could keep homes as clean as present times. To try and keep domestic belongings, like cups and plates, free from dust and dirt homeowners placed them within cupboards. Instead of the metal, lockable and double door versions we offer - like our low double door model - items in the 14th Century were a collection of shelves made from wood. This design remained in-demand for a long time, and it was around 200 years later that they became closed off with doors. As with product design in modern times, investors respond to the needs of buyers, and doors began to prove very useful when it came to storing food, as it was kept fresher, especially when ventilation shafts were added to cupboards. More diverse items began to be stored in cupboards, and some of them developed different names to account for their use, such as wardrobes. By the 18th Century many homes had cupboards integrated into their walls, rather than the standalone types that are common today, but they featured paneling and are comparable to today’s built-in wardrobes. After WWII, lots of manufacturers began experimenting with many different kinds of materials, especially in the US. Metals, like steel, were increasingly popular in homes and companies, with many products, from cars, to cabinets to cupboards, being made with innovative materials. Cupboards made from this material proved to be a fantastic idea for offices and companies who were keen to purchase robust products that are steady, reliable and look very modern too. All these benefits are still attractive today, which is why our double door cupboards are such a popular item for business premises requiring storage. The fact our low cupboards are made from metal, makes them the perfect option for use in offices and corporate locations. Furniture such as this may be accessed and used constantly throughout the day, as colleagues take out stationary, texts, files or even their own valuables stored within them. 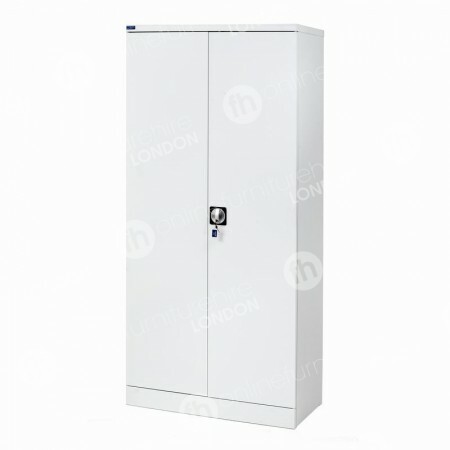 For this you need a strong, robust product - which our cupboards are, thanks to the metal they feature. In addition, this product also has integrated door stiffeners so it keeps its tautness and strength over time. Another great benefit to our low cupboards, is that they are spacious, so you have room for all those necessary office items, from books, to files, paper and more. 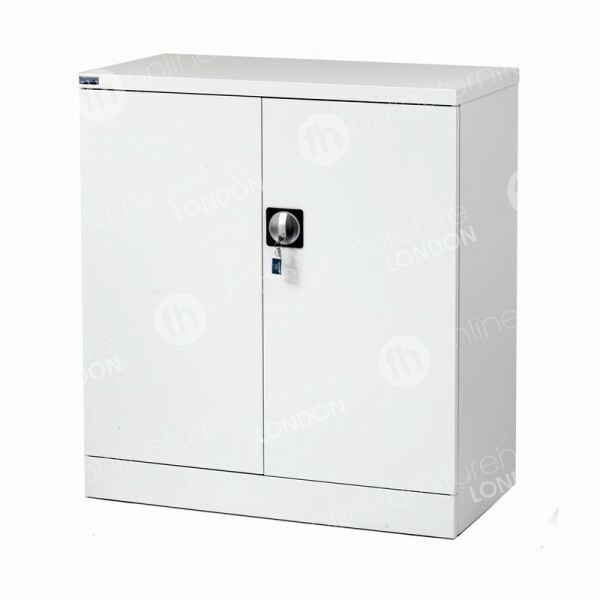 What’s even better, is that our cupboard range is lockable too - so you can store confidential data or valuable items with confidence. When you'd like more room, then how about our 1830mm taller cupboards, which offer more space, while our 2 and 4 drawer filing cabinets are a modern for file storage. What’s the benefit to choosing a cupboard with a lock? It gives you some extra security if you’re looking for a place to store valuable items or confidential documents. If you prefer you can leave it unlocked, which is useful when it’s used to store items needed by lots of members of staff, such as stationery and paper. Are the internal shelves fixed? No, how you adapt the space is up to you. Our larger cupboard has three shelves and the low cupboard has one.